In my last post, I explained the trading technique with the effective Moving Average and MACD Train trading system. Almost every trading systems create false signals. We cannot make any trading system that does not deliver false signals. Trading systems are primarily developed with the technical indicators which are the result of data analysis and presentation. Traders need to have the skills of identifying false signals or skills of applying the trading systems more effectively. 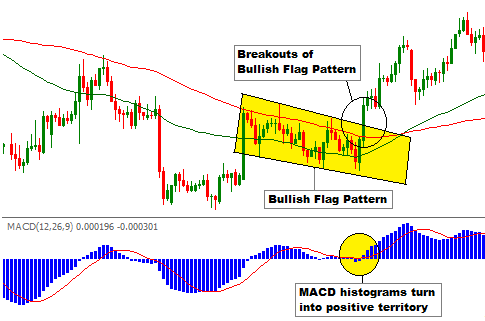 This post explains the principles to identify the long entry signals more effectively or to understand the bullish trend more effectively with Moving Average and MACD Train trading system. 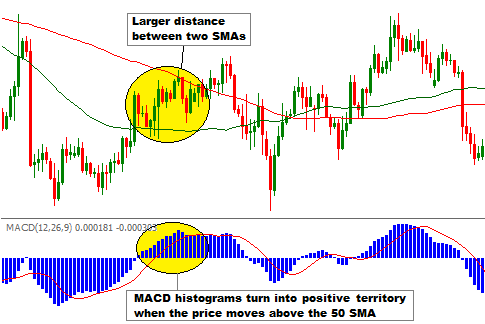 With Moving Average and MACD Train trading system, we generally find the long entry signals when the price moves above the 50 and 100 simple moving average, and MACD histograms turn into positive territory from negative territory. 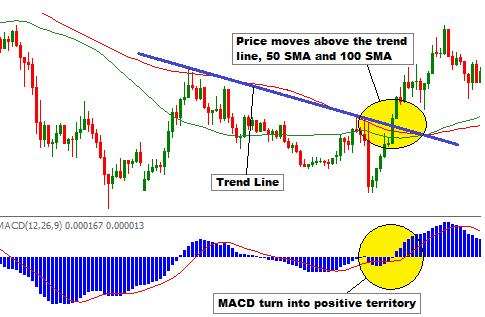 Sometimes, the Moving Average and MACD Train trading system provides the long entry signals according to the principles, but the price does not go that much high. In the illustration above such an example is presented, where the price moves above the 50 and 100 SMAs, and MACD histograms turn into positive territory, but the price does not move that much high. Red line is the 100 period simple moving average, and green line is the 50 period simple moving average. I noticed two important issues in the illustrated situation, firstly, the distance between the 50 and 100 SMAs is relatively large, secondly, the MACD histograms turn into positive territory just after making a single negative loop like formation. My practical experience with MACD histograms says, when MACD histograms turn into negative territory, it turns into positive territory for a longer period after making couple of negative loop like formations. If MACD histograms turn into positive territory after making a single negative loop, this zero line crossover may not be reliable long entry signal. 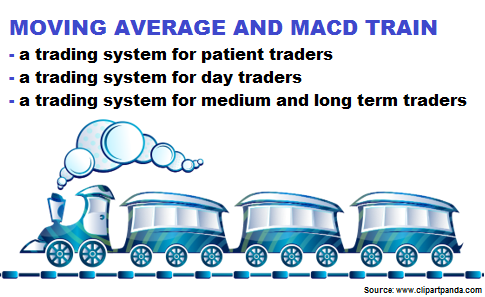 With the Moving Average and MACD Train trading system, we always have to consider the distance between the two moving averages. The breakouts of squeeze of two moving average give us more reliable entry signals. In the practical market situation presented below, the 50 SMA and 100 SMA are not in a romantic mood, upset going on in their love story, they are staying away. In this situation a successful breakout of the two moving average indicators are unexpected. If the breakout happens, in the meantime, the MACD histograms already make a complete positive loop like formation. Generally, if the MACD histograms turn into positive territory when the price moves above the 50 SMA, the 100 SMA represents a strong resistance area. In this type of situations, a long entry may not be that much profitable. In some rare situations, Sun and Moon both come before our eyes together. I am talking about the situation when price moves above the 50 and 100 SMA, and also breakout of a chart pattern happens. In the above illustration, a bullish flag chart pattern is created through the 50 SMA and 100 SMA, and the breakouts of the SMAs and bullish flag are happened simultaneously. At that time MACD histograms are going higher than the zero line. It is one of the examples of reliable long entry signals with this trading system. Very rare people who are nocturnal can see the beauty of a Comet and a Moon in the sky. Similarly, a few number of traders who can see a trend line on or close to the 100 SMA. I have presented situation from the practical price chart where a trend line is almost on the 100 SMA. We can see the price moves above after reaching the trend line and 100 SMA. In such situations, a buy order can be placed when the price moves above the 50 SMA, and MACD histograms turn into positive territory or grow longer. 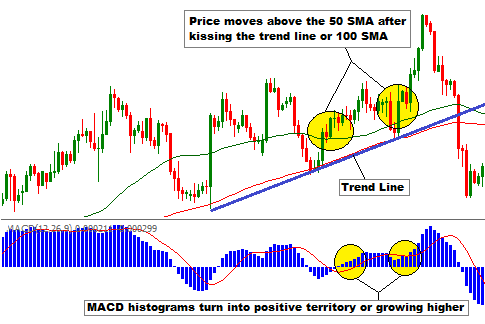 In above price chart, a trend line is found on or very close to the 100 SMA. This time the 100 SMA is above the 50 SMA. In such cases, when the price moves above the 50 SMA ,100 SMA and trend line, and the MACD histograms turn into positive territory, it can be considered as a reliable long entry signal. 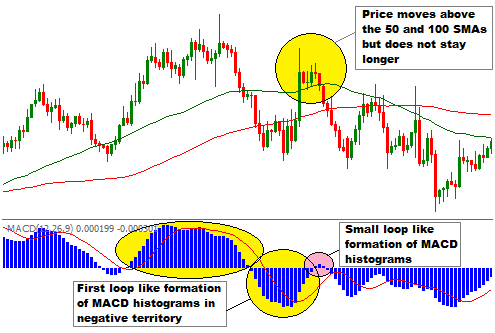 Dear Traders, I hope this post will enrich your knowledge to apply the Moving Average and MACD Train in your trading. If you have any question regarding this post, you can drop it into the comment section below.You can also share your experience while trading with this trading system.